We’re an ALL-STAR collective of professional dancers that specialize in the Lindy Hop, Collegiate Shag, Balboa, Charleston along with the Early Social Jazz Dances that inspired all the dances that were born in America during the period of the 1920s – 1950s. Our DANCE TEAMS are made up of some the most talented dancers in the nation. The SHOP featured on this site is the brain child of social dancer and American Swing Dance champion (1998) Paolo Pasta Lanna. The accessories in our SHOP were selected out of our desire to offer functional souvenirs that would be enjoyed by our fans. Our Sneaker Bags were first manufactured in 2015 and they feature our team LOGO. We hope you enjoy these neat accessories as they will certainly become collectors Items. The Lindy Hop All-Stars (LHAS) – The Lindy Hop All Stars are a high energy, high flying dance collective who specialize in the early American dance crazes such as the Charleston, The Lindy Hop, The Jitterbug, The Big Apple, and the Collegiate Shag. Their routines, which are inspired by the masters of the swing era, are marvelously nostalgic and feature high flying aerials and dynamic partnering. The Lindy Hop All Stars enliven corporate events, weddings, birthday parties and they also offer school programs that are educational, historical and engaging with both young and old. And everyone leaves feeling their youth again. The Rhythm Stompers – The Rhythm Stompers bring the freshest talents to light with this avant-garde collective of swing specialists. These dancers feature the hottest trends in Swing, Ballroom, Blues, Hustle, Mambo and more. we have routines that are ready for prime time from the Early American born social dances to the most popular partner dances of today. The Rhythm Stompers have been featured at Jazz At Lincoln Center’s Rose Hall, Hudson River Park’s Moondance, Lincoln Center’s Midsummer Night Swing, The Paramount, John Jay College, Swing Remix, Salute To Seniors at The Westchester County Center, and a multitude of special events. BB Kings featured this team for a multitude of functions featuring American born music styles. And our members have performed around the world from The Umbria Jazz Festival in Italy, to The Hep Cat Holiday, England. The Jumpin Jacks are a new student performance group led by award winning Lindy Hopper Paolo Pasta Lanna with contributing choreography provided by stars of the Lindy Hop world including Carol Callahan Fraser. The Jumpin Jacks Performed their premier routine on Friday DEC 7th, 2017 at Swing 46. The showcase was filmed during the first band break on the night when the JIVE ACES from ENGLAND appeared. The Jumpin Jacks train at You Should Be Dancing studios in NYC. The group is open to social dancers with experience in Swing Dance. The Flying Camels – The Flying Camels are our newest team that specializes in The Collegiate Shag. They’re a collective of both pros and students and we train weekly. The Collegiate Shag is one of the most dynamic and exciting swing styles in the world and it’s got a wonderful history who’s origin is rooted in The Fox Trot. That’s surprising for many because the dance is filled with kicks more indicative of The Charleston. To find out more about how you can get involved, email us at info@LindyHopAllStars.comWe rehearse Sunday evenings at You Should Be Dancing studios in NYC and we’d love to recruit more talent! This collective began back in 1999 with an ambitious vision to unite a dazzling crew of talented local dancers which included notables Janice Wilson, Roddy Caravella, Angie Whitworth, Beverly Moore and the Late Great Tyrone Cooper (of Mamma Lou Parks). Their first performance premiered with Wynton Marsalis and the Lincoln Center Jazz Orchestra at Roseland Ballroom. Later editions of this collective have since performed from Lincoln Center to the Kennedy Center, and abroad in locations as far as Amman, Jordan and Tokyo, Japan. Now reincarnated with an expanded cast of New York talent, they’re making a splash with fresh new numbers. Our choreography has been provided by these notables: Evita Arce & Michael Jagger, Roddy Caravella, Adrienne Weidert, Paolo Pasta Lanna and Gaby Cook with contributions from many in our cast of dancers. One of our original shows, “A Century of Swing“ is a presentation of social dances beginning with the 1920’s Charleston and continuing through to the 1960’s Line Dances. Our dynamite bang em up finale features high flying air steps and the best in The Lindy Hop. Some of our past shows include “At The Hop” focusing on the 1950s jitterbug as well as “The Roaring 20s” featuring a sultry, provocative show girls number and a fabulous charleston/collegiate shag group routine. We can also cater our show to your specific needs. We have performed all throughout the East Coast at venues ranging from The USS INTREPID to the prestigious Lincoln Center and we hope to add you to our list. See our calendar for upcoming shows in your area. The Lindy Hop All-Stars mission is to build and maintain a World Class Lindy Hop and Swing performance troupe that represents, embraces and carries the torch of these original American dances to future generations. With our demonstrations of the Lindy Hop and the dances that grew from it, we strive to build an appreciation for theses historic, true American art forms. These stylish and improvisational social dances thrived in a society that permitted freedoms of expression. Today, they continue to provide avenues for creativity and innovation as they further evolve with each new generation of dancers that discover them. Our efforts to inspire, educate and also encourage the public to give them a whirl, also helps flourish a community that is physically active, socially sound, joyous and welcoming to one other. Today, with our strong established core of professional instructors and performers, the LHAS continue with efforts at community outreach, participating in local fairs, festivals, celebrations, and educating in schools and unique charity organizations. And in the spirit of New York’s long history of Lindy Hop, the LHAS continue to push the boundaries of their performance pieces with professional shows that electrify and delight audiences from coast to coast. Coordinated by Paolo Pasta Lanna who is also the founder, the LHAS bring together top talent, comprised of award winning dancers, acclaimed instructors and professional performers with each couple bringing a unique personality and style to this collective. The Lindy Hop (or Lindy) is a partner dance that originated in 1920s and 1930s. Often described as the grandfather of all swing dance, The Lindy Hop evolved at the Savoy Ballroom and in the streets of Harlem. It is considered one of the true American Art forms and has been experiencing a resurgence of interest around the world. It was 3 wonderful nights and people are talking about this concert more than any other we’ve done in quite some time. Everything was incredible. Thank you for arranging this great crew of dancers. 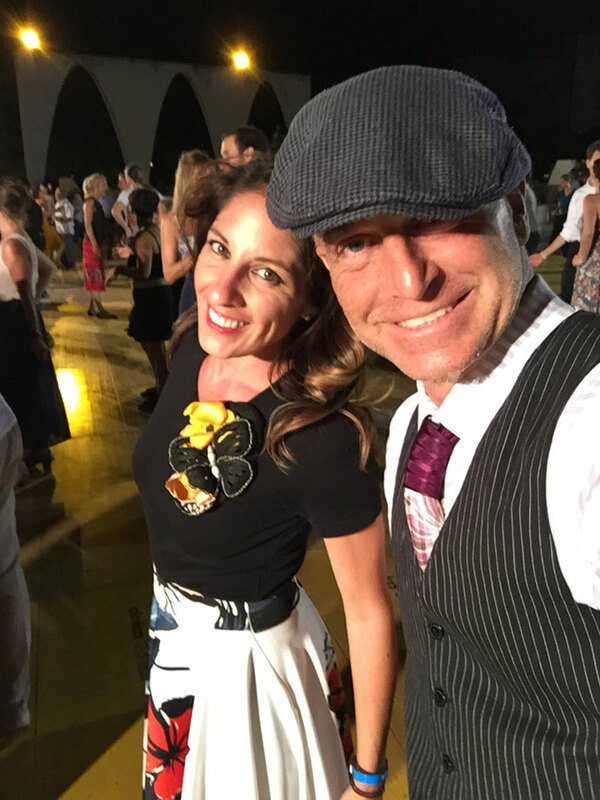 We would like to extend out sincerest gratitude to you for helping to make our Midsummer Night Swing season such a success!… We received many compliments from patrons expressing how much fun they had during your lesson! It was due to your professionalism and dedication that we were able to create such a memorable evening for our audience. Thank You and your Entire Troupe for an exciting and wonderful addition to the year’s GALA…..